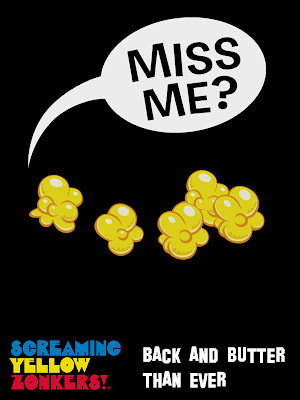 Neato Coolville: THE RETURN OF SCREAMING YELLOW ZONKERS! THE RETURN OF SCREAMING YELLOW ZONKERS! Ahem...I have an important announcement to make, so please stand back. SCREAMING YELLOW ZONKERS!!! SCREAMING YELLOW ZONKERS!!! 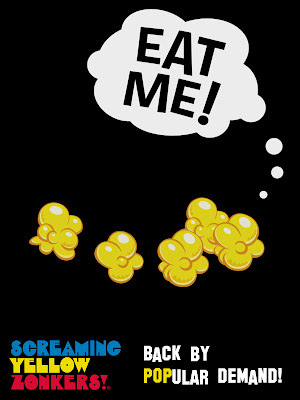 SCREAMING YELLOW ZONKERS!!! 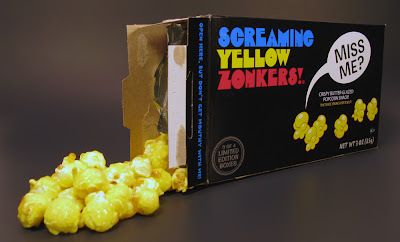 Sorry for all the screaming, but I just had to let everyone know that Screaming Yellow Zonkers, the classic snack from the 1970s, is making a comeback. 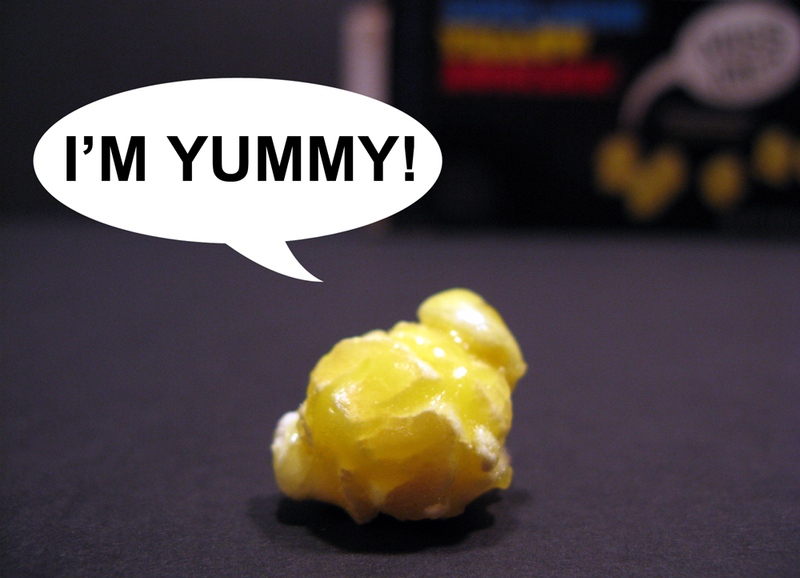 That's right, on May 15, 2012, you'll be able to buy boxes and boxes of some yellow goodness. See the box above? Yeah, that's one of the new boxes that you'll see at Walgreens. Old timers will quickly recognize the retro look as this new incarnation has the same zany spirit of the original Screaming Yellow Zonkers. It's almost as fun reading the box as it is eating the SYZs. Apparently there will be four limited edition boxes to choose from. Here are three box designs that you might see on the 15th. Yesterday I was fortunate to receive a sample box in the mail. I shared the butter-glazed popcorn with the first lady of Neato Coolville and a friend. 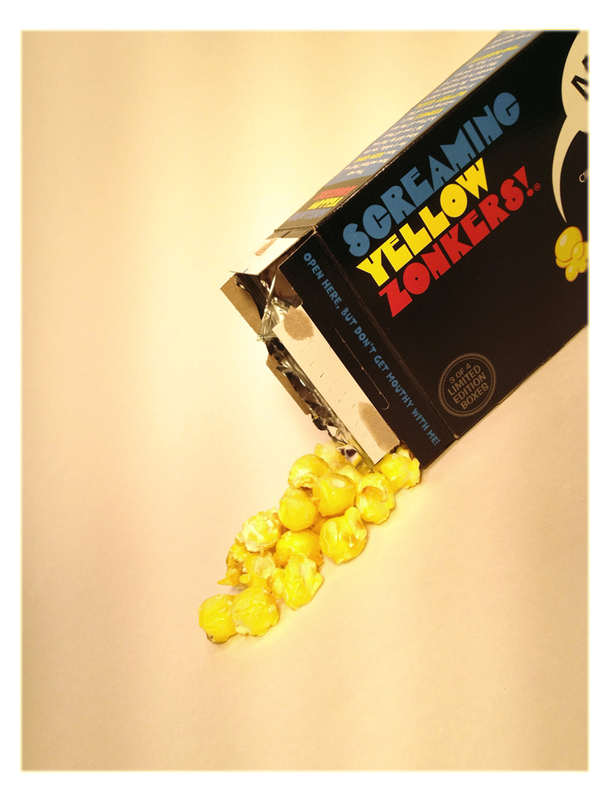 Needless to say we went bonkers for these Screaming Yellow Zonkers! Just like the box says, "The taste speaks for itself!" Does anyone remember this catchy jingle back when SYZ was new? It was a bit before my time, but now I can't stop singing Screaming....Yellow....Zonkers. Video uploaded to YouTube by televisionarchives. Besides being a tasty snack, SYZ is well remembered because of the boxes. 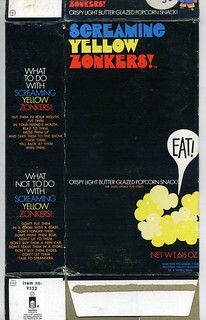 Back in the late 60s and early 70s, the boxes stood out in the snack aisle. It was a combo of the daring use of a black box with witty copy and fantastic artwork. 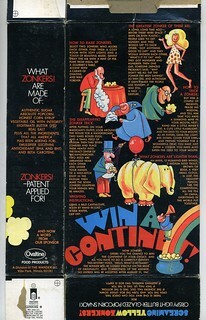 From Dan Goodsell's collection, here's the very first SYZ box. Click here and take a trip down Zonkers memory lane with Dan's collection of SYZ boxes. Be sure to visit Walgreens for a Screaming Yellow Zonkers fix on May 15. Good chance you'll see me waiting in line with my arms full of black boxes! 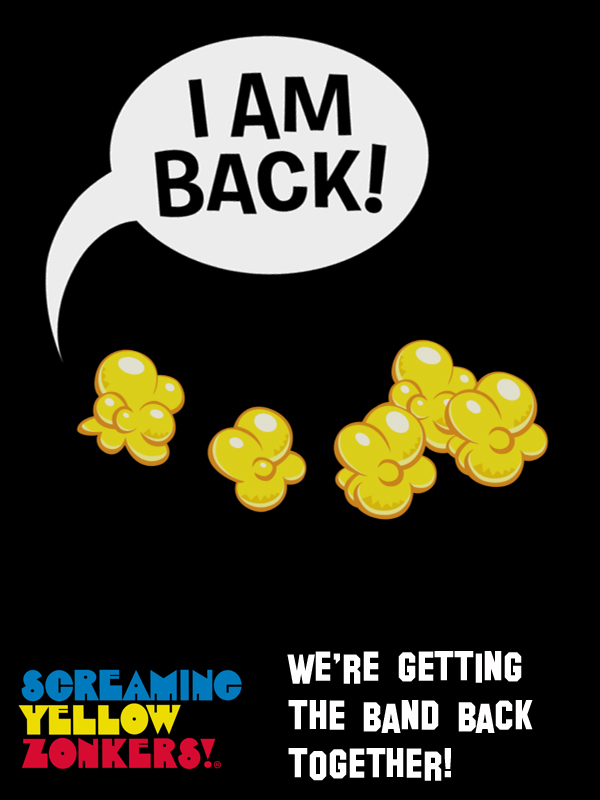 Welcome back, Screaming Yellow Zonkers! You've been sorely missed!! Yes! I used to love these! I will be at Walgreens getting some, too! i told my wife i wanted a box of SYZ for my birthday, i'm psyched about this, thanx for the head's up! Man, I love Zonkers. As recently as a few years ago, I could get them at the convenience store at the university where I work, and then they were gone. I'm going to stock up on them this time! Thanks for the news flash! I'm looking forward to getting some of these. Can you bring back the squirrel candies coconut, mint, strawberry and grade.